We have published a timelapse film of the tree planting activities undertaken earlier this year in our OneOak project. The pictures were taken over four months in the Blenheim woodland and start with the unveiling of the OneOak sculpture plus the first trees being planted on January 31st. Also captured are the visits by 250 school children during February and March when every child planted an oak tree. The new forest of 250 OneOak trees are protected by tree shelters and by April were surrounded by a carpet of bluebells. OneOak Spider Bench by Ian Smith. 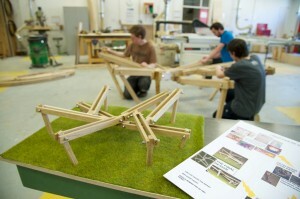 In the foreground is the model, with students constructing the actual bench behind. Photo OCVC. Students from Rycotewood Furniture Centre at Oxford & Cherwell Valley College have been working with our partner schools to design benches for their school grounds, to be made from the timber of the OneOak tree. 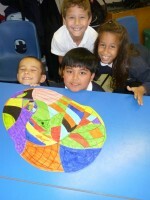 Furniture Design Student Ian Smith has been working with Stonesfield Primary School. Here is his story. The OneOak seating project was a great chance for me to involve children in the design of outdoor seating for their own school. 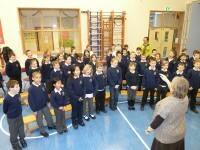 Working with the children at Stonesfield school was an exciting opportunity for me as a designer. I was keen from the start to try to involve the children’s ideas without leading them too strongly in any set direction. I also wanted to produce a design with impact and that would make a statement so the children would feel that the tree had been transformed personally for them into something unique. It quickly became apparent that children viewed seating in a very different way to adults. We have set standards and requirements that must be met, however, the children’s ideas were quite different. 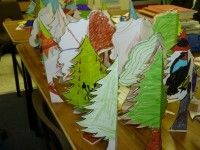 They wanted excitement and adventure, this was further reflected in the ideas and designs the children produced. Following this lead the final design followed a spider theme that the children had included in some of their design work. The final piece reflects a spider, has a dynamic feel of movement and allows seating at different heights, hopefully a reflection of the children’s ideas and wants. This project showed me that involving the children created a completely different approach to my usual work, the children added ideas and concepts without the restrictions of the standards we all adhere to. This was a valuable lesson in designing with an open mind. Ian Smith, Furniture Design Student 2010/2011, RYCOTEWOOD FURNITURE CENTRE. Musician Sarah Morgan visited Willowcroft Community School, one of our OneOak partner schools, earlier this week to practice and record two tree planting songs. The songs will be performed by 250 children from all our five partners schools when every child returns to the OneOak woodland to plant an oak seedling in early February. Roots in the earth, leaves in the sky. Going to choose my tree to build their nest. We’re planting a forest for you and me. Children from all our OneOak partner schools have completed their next design workshop with students from Rycotewood Furniture Centre. Our CEO Gabriel Hemery joined with the students on a recent visit to three classes at Wood Farm Primary School where the children started developing 3D models. They came up with some great ideas. 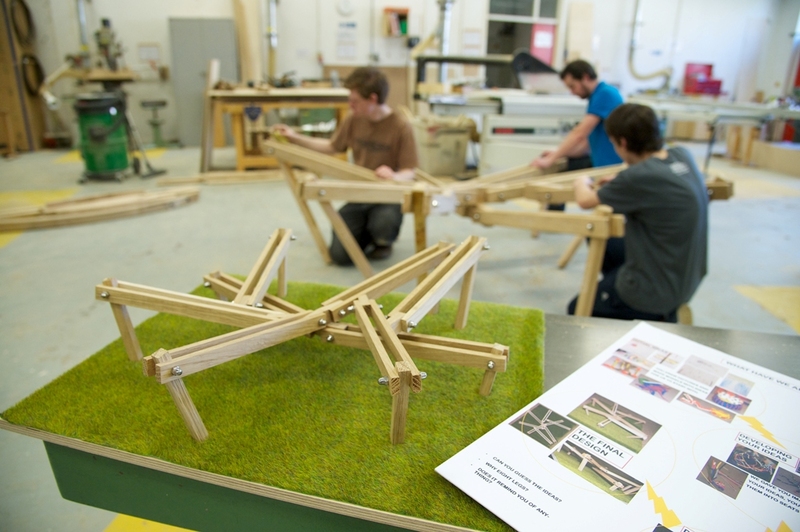 The children will be visiting Rycotewood Furniture Centre at Oxford & Cherwell Valley College early in 2011, when they will see the final designs developed by the students and be able to vote on their favourite for their school. Each school will have an item of outdoor furniture made for their school grounds, from wood sourced from the OneOak tree. Students from Rycotewood Furniture Centre, part of Oxford & Cherwell College, have started working with our five OneOak partner schools. Over the next few months they will be working closely with the same children who had watched the OneOak tree being felled last January, to design and build outdoor furniture for each school, made from the timber of the OneOak tree. This week six of the students visited Wood Farm primary school at Headington to meet the children and to start work on the creative side of the project. The next visit in about four weeks time will focus on designing the outdoor furniture, followed by a visit to the college by the children to see the workshops and the work in progress.